Two facing walls of the square white room display large white drawings. The other two facing walls display large black drawings. The carpeted floor uniting these planes is gray. Three white pedestals placed in the middle of the room proffer pages of text. Somehow, it all feels very Zen. Artist Jennie Kiessling describes herself as a lay practitioner of Zen Buddhism, but she is also an avid art history scholar and a master of her materials. 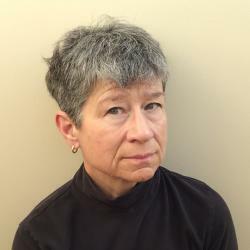 As an adjunct faculty member in Visual Media Arts at Front Range Community College in Fort Collins, Colorado, she is fastidious about citing her sources and inspirations. The drawings and text she presents in this solo exhibit offer a layered experience for any visitor. The display seems particularly well-designed to serve students in the classrooms of Laramie County Community College, Cheyenne. They pursue their own projects in art history and studio art just yards away from the gallery. All the drawings in this exhibit are untitled with subtitles, and unframed, which allows the viewer to closely examine Kiessling’s large sheets of pergamenata parchment vellum paper. 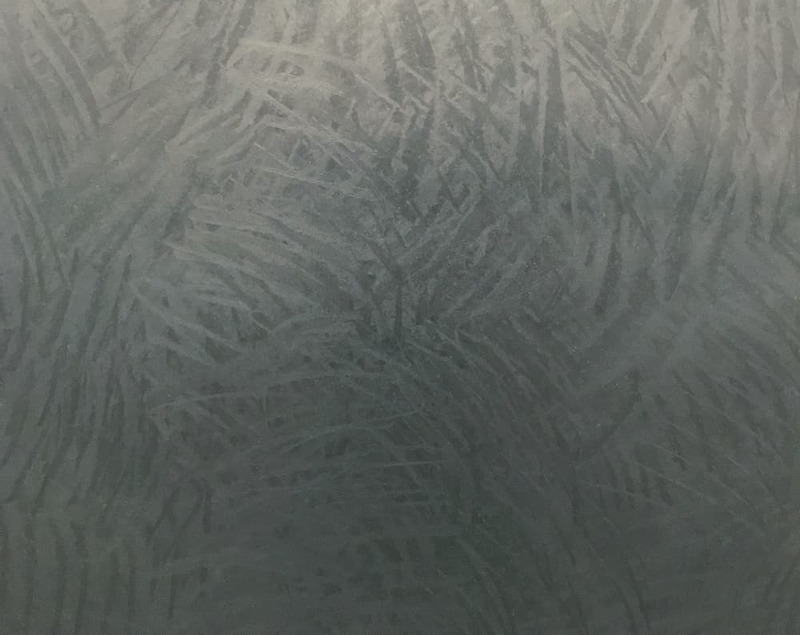 Each liberated yet vulnerable skin is held to the wall by tiny silver magnets. The drawings are beautiful and intriguing abstractions. Each of the drawings, both black and white, result from a binary process. Graphite is applied; graphite is erased. In the end, some of the graphite remains. Of course, nearly every drawing is made this way. The difference here consists of intention. The meaning is in the process — mark-making versus erasure — and emphasis: the greater the deposition of graphite, the more emphatic the erasure/erosion, and thus more emphatic the meaning. What I call the “white” drawings (graphite lines drawn on white paper) all date from 2016. They are so faint that from a distance they may appear to be blank sheets. Kiessling has marked their surfaces with delicate, precisely vertical or horizontal parallel pencil lines, all laid down freehand while standing at her studio wall. Rows of lines accumulate into blocks that are later erased in part or in whole, leaving pale tonal squares that in some works stand alone, and in others overlap. Reading the labels for each, the viewer sees that the subtitle reveals the process used to create the work: “once drawn, once erased blues” and “drawn four times, erased once, drawn over purple, yellow, maroon, off center” and “two erased reds,” for example. Kiessling told me that symbolic color plays a role, with certain hues and color combinations keyed to major art historical figures like Piet Mondrian, Hans Hofmann and Mark Rothko. Kiessling described her frame of mind in this white series as meditative, optimistic, and tranquil. 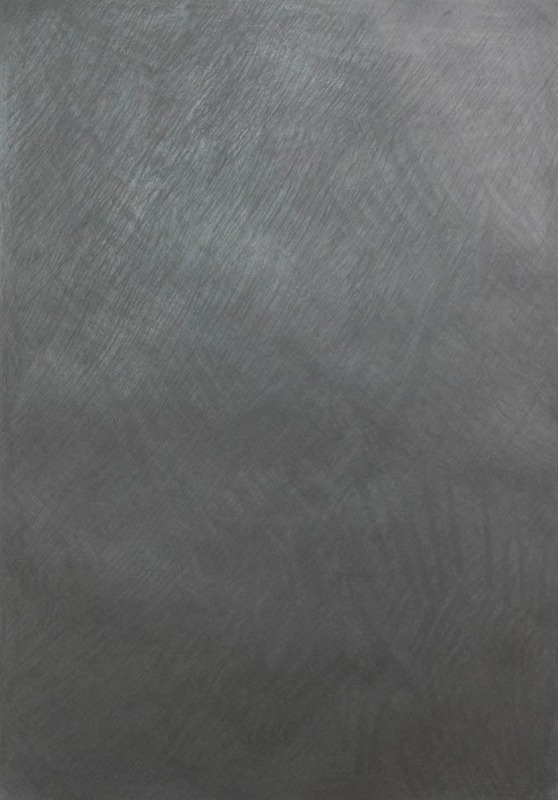 The finished drawings are paradoxes, in which the removal of marks is greater evidence of the artist’s intervention than the application of marks. Their fragility could be a metaphor for memory and materiality, hinting at what the artist “withdrew” from existence. Or they could simply be subtle and elegant examples of how drawing can intersect with philosophy and art history. 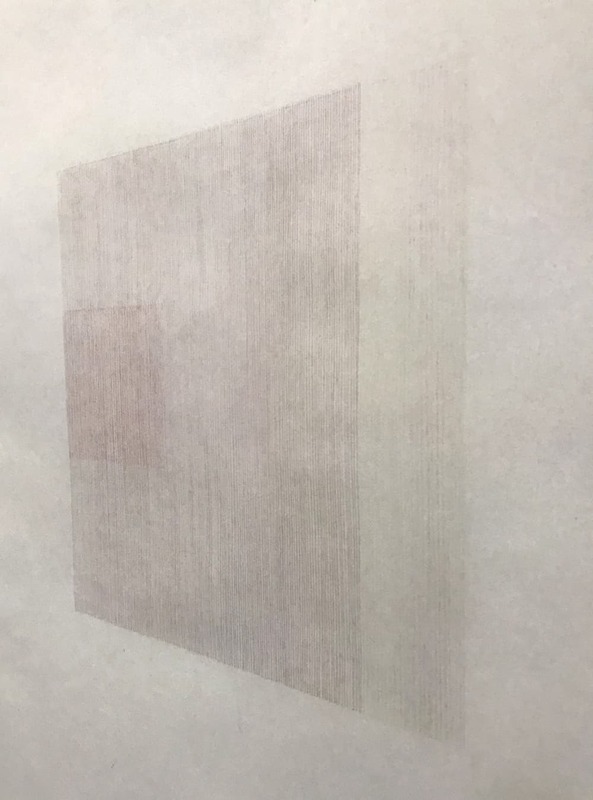 The transparently performative aspect of Kiessling’s drawings – informing the viewer of her method – as well as the completed drawings’ abstract purity, echo both 1970’s conceptualism and minimalist drawings by artists like Robert Mangold, Agnes Martin and Sol LeWitt. What I call the “black” drawings (white paper completely blackened with graphite) are from an ongoing series begun in 2017. Where the white drawings are stark in their delicacy, the black drawings are aggressively cumulative. As one walks up to their nearly opaque, burnished surfaces, each reveals a richness of textures, marks and tones. In the end, the nearly-metallic face of the blackened paper bears signs of the battle between addition and subtraction: directional marks and abrasions reminiscent of scratches, hair, fur or feathers. 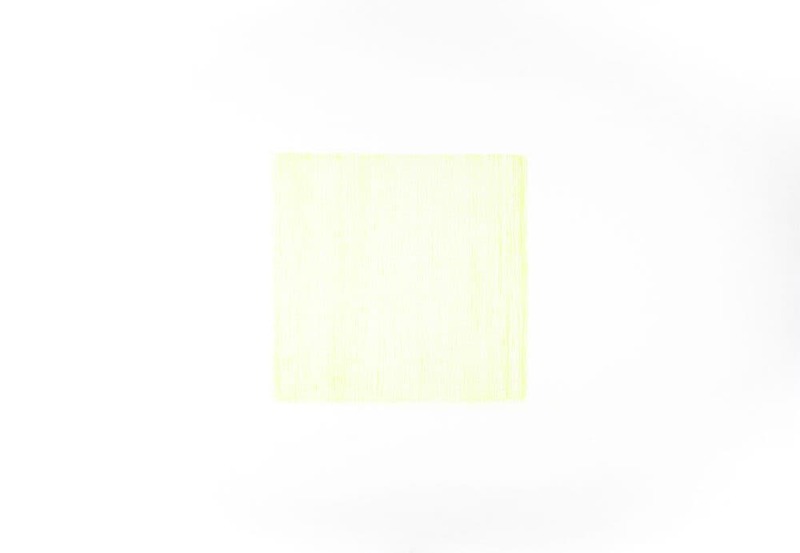 Several drawings possess a submerged layer of colored pencil, symbolic as in the white drawings, but less discernible upon completion. Examples are Tuscan red, in reference to blood, the Renaissance, and Kiessling’s ethnic background; olive for the military; and black for racial issues in the United States. These underlying colors are noted, but not explained, in the subtitles of the works. The exhibit title, SAMEMIND, proposes that the series of white drawings and the series of black drawings share the same originating concept. “The works are the same body,” Kiessling told me. “If viewers are with the work for an extended period, they will ultimately come to the same conclusion.” Kiessling also intends SAMEMIND to refer to our shared human consciousness and experience. As if to emphasize the latter point, each of the three pedestals in the center of the gallery offers a page of text reproduced from a published work by an important 20th century creative thinker whom Kiessling has studied and admired. Zen Buddhist D. T. Suzuki, minimalist painter Agnes Martin, and modernist titan Ad Reinhardt influenced each other during a formative period of American art, and influence Kiessling now. The writing of others contributes to the artist’s web of ideas and artwork, demonstrating her concept of SAMEMIND at work. The gallery visitor does not need to absorb all the text to enjoy the exhibit. For those who are there mostly to see and sense, I recommend saving scholarship for another day and concentrating on these lush yet fundamental drawings. However, I do find the uneasy union of aesthetics and intellect an interesting example of the contradictory tides that today’s artists inherit from past and absorb from present centuries. Like many trained in the previous century, Kiessling’s foundation is modernist, which I would characterize as resolutely faithful to formal elements such as color, shape, scale, line and texture. Modernism invites finely-tuned perception and appreciation of art for its own sake. It also honors the individual’s creative vision above all. Generally speaking, modernism treats process as a means to an end, but encourages artists to break away from established artmaking values and methods. The inevitable outcome of modernism, so-called postmodernism, could be characterized as a turn toward alternative media and processes, collaborations, and the examination (sometimes called “deconstruction”) of systems. Often more concerned with ideas than with visually enticing objects, postmodernism interrogates cultural hierarchies and focuses on the artist’s place in a social context. Postmodernism enriches the artist’s toolkit, but in its pure form, can return the artist to a position of servitude to society. Art lover? Subscribe to WyoFile’s free weekly newsletter for the latest on the gallery scene. Riding the penumbra-eclipse-penumbra of one century into another, Kiessling is a hybrid practitioner, a modernist who also embraces postmodernism. She is passionate about the aesthetic quality of her materials and the value of her own creative imagination. At the same time, she is mindful of the shifting sands of identity, meaning, and the roles of the artist and the art consumer in society. If this seems like a contradiction, it is a contradiction shared by many living American artists, and its “same mind” is fertile soil for some of our most interesting contemporary art. Kiessling’s dual approach drives her to make beautiful abstract drawings that nevertheless hew closely to the current credo that the artist is an observer of the world and cannot help but communicate her environment. More of Jennie Kiessling’s work and writing can be found at www.kiesslingpainter.com. SAMEMIND is on display at the Esther and John Clay Fine Arts Gallery at Laramie County Community College in Cheyenne through March 1, 2018. Sue Sommers is an artist in Pinedale, Wyoming. 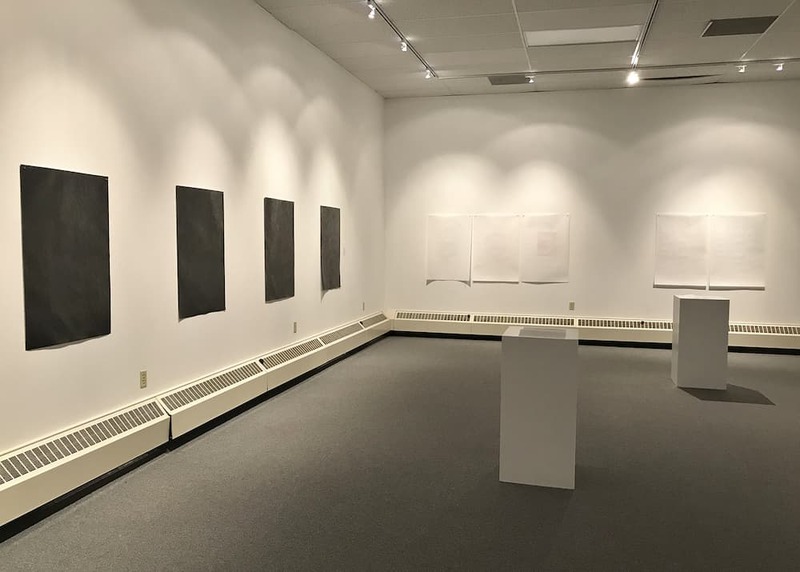 Sue Sommers’s essay about Jennie Kiessling’s SAMEMIND graphite drawings exhibition explains clearly what the drawings are about. The contrast of light and dark supports a philosophical approach to both making the drawings and seeing them. The abstract images speak clearly to this viewer about what one might see and what one does not see. I also appreciate Sommers’s reference to addition and subtraction, and a viewer can read Sommers’s commentary and look at the images with new ways of seeing them. Lovely images and excellent essay.